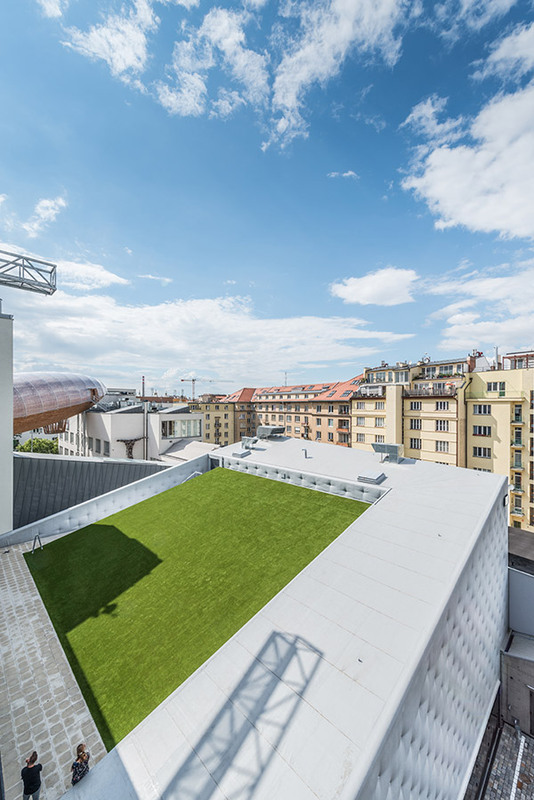 The DOX+ complex of buildings expands the DOX Contemporary Art Centre in Prague, the Czech Republic. The original complex focusing on exhibition areas was expanded by special areas for dance, music, film and a school of architecture. 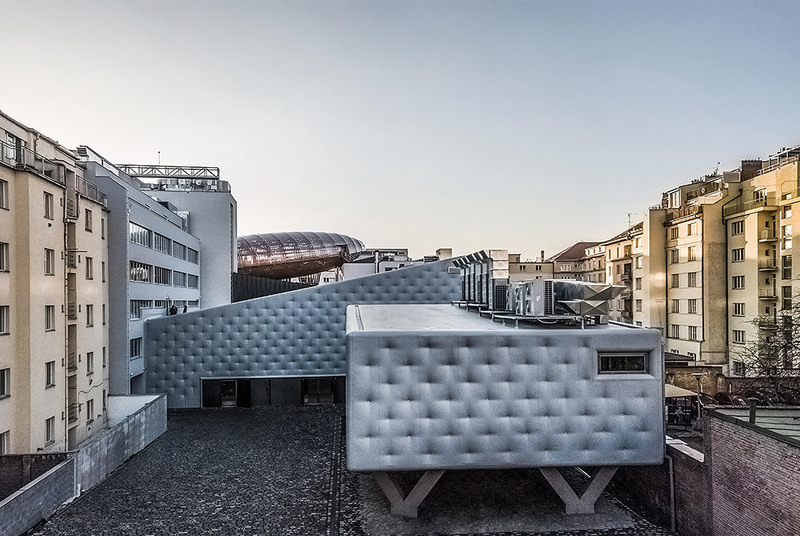 DOX+ consists of three buildings: administrative with the school of architecture, an experimental music and dance hall and a dance rehearsal room. The buildings are a single unit from the architectural aspect and this principle is symbolically expressed by the unified grey colour and fluid interconnection of all parts into one whole. As a result, the complex can be perceived as a single structured statue. 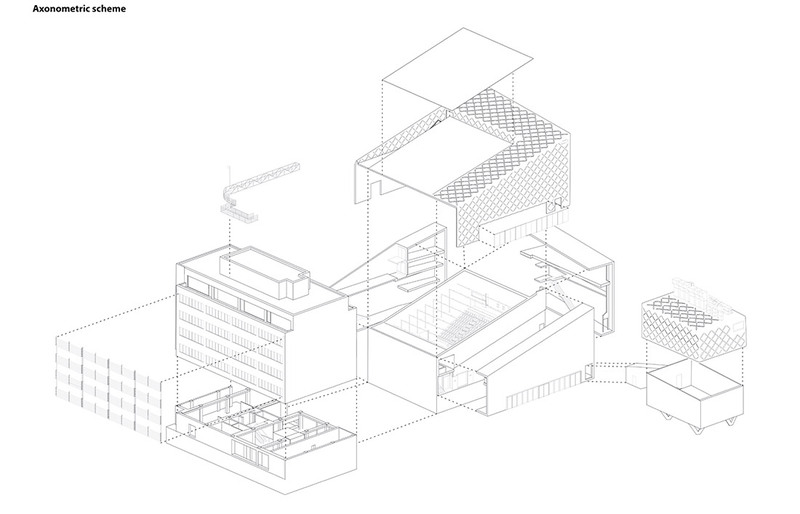 The administrative area, with entrance lobby, club and restaurant, serves as the ARCHIP School of architecture. This building originated on the basis of renovation of the original building dating from the 1970s, and the typological arrangement of its inner core and open layout has been preserved. Renovation of the interior respects the materials used at the time the building was constructed (linoleum, wood veneer doors, terrazzo….). The experimental music and dance hall and dance rehearsal room are cast using béton brut. The reinforced concrete buildings are “clothed” in a soft façade which protects them against freezing or overheating. The insulating wool is covered in a flexible insulating membrane which is anchored to the concreted in the pattern of a regular grid. 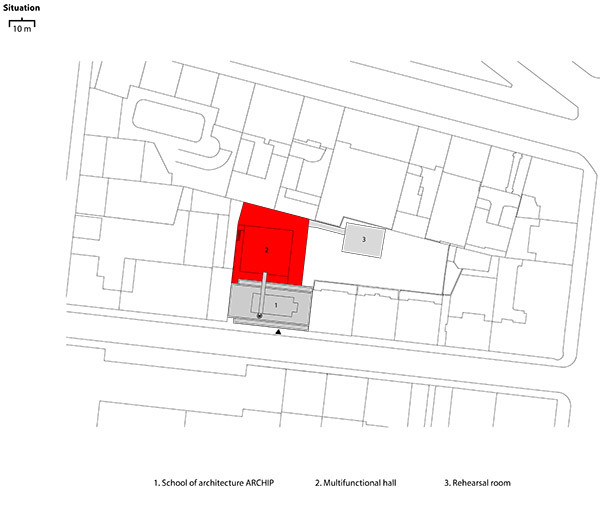 The façade absorbs residual noise escaping from the hall and reduces the acoustic burden on the residential courtyard. Thanks to the pattern, which is based on furniture upholstery, the halls are reminiscent of two large sofas. An upholstered furniture pattern was chosen for its effectiveness in distributing tensile forces along the surface of the fabric. Enlargement of this pattern had no negative effect on its structural properties and, as a result, the plastic film does not tear in extremely cold weather as its shrinks, and tension is not lost when surface temperatures rise in the sunlight. The hall has variable acoustics and can be compared to a musical instrument which can be tuned depending on the needs of the specific performance. The rotating three-walled under-ceiling panels and foyers are used for this. 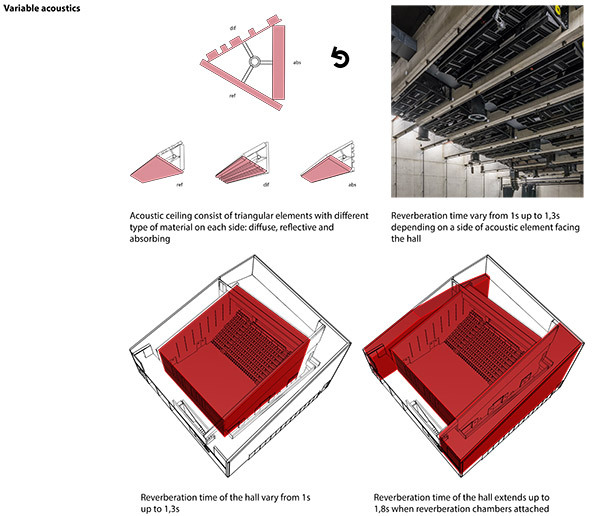 The three-walled panels are supported by a sound absorbent, diffuse and reflective surface and can be rotated to modify the acoustic properties of the ceiling, thereby changing the acoustic parameters of the entire hall. In order to extend the fadeout effect, the main hall is surrounded by a ring of foyers which can be used as fadeout chambers in the case of special performances. The addition of these areas to the volume of the main hall results in a significant extension of the fadeout period particularly in the lower frequencies. The square floor plan also means there was no need to clad the walls in acoustic panelling. The hall has seating for 550 guests and has become famous for its acoustics during its brief existence. It is currently also used as a reference recording studio. The roof of the hall is a grassy meadow used for relaxation, outdoor installations or simply as a place for outdoor performances. There is a suspended bridge over the auditorium for acrobatic dancing. 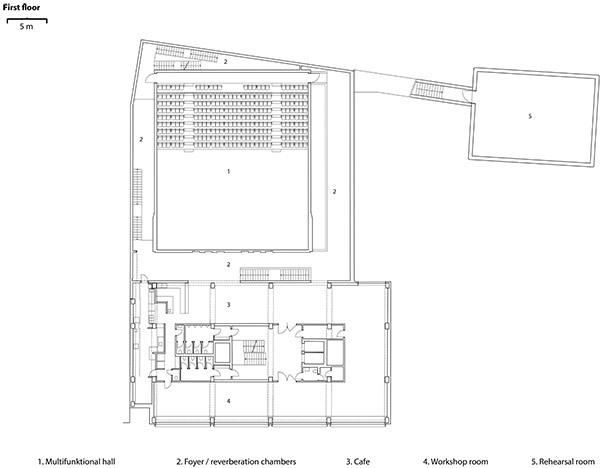 The dance rehearsal room has a floor plan with dimensions identical to the stage in the main hall. It “dances” above the inner courtyard on diagonal columns. The geometry of these columns is not random, but avoids the traffic plan and technical installations below the floor tile. The new hall has variable acoustics and can be compared to a musical instrument which can be tuned depending on the needs of the specific performance. The rotating three-walled under-ceiling panels and foyers (reverberation chambers) are used for this.